In a further attempt to stress the variety of work in Geography, and also its relevance to everyday life, this month I’d like to highlight Franklin Ginn’s (2014) recent article on human-slug encounters. 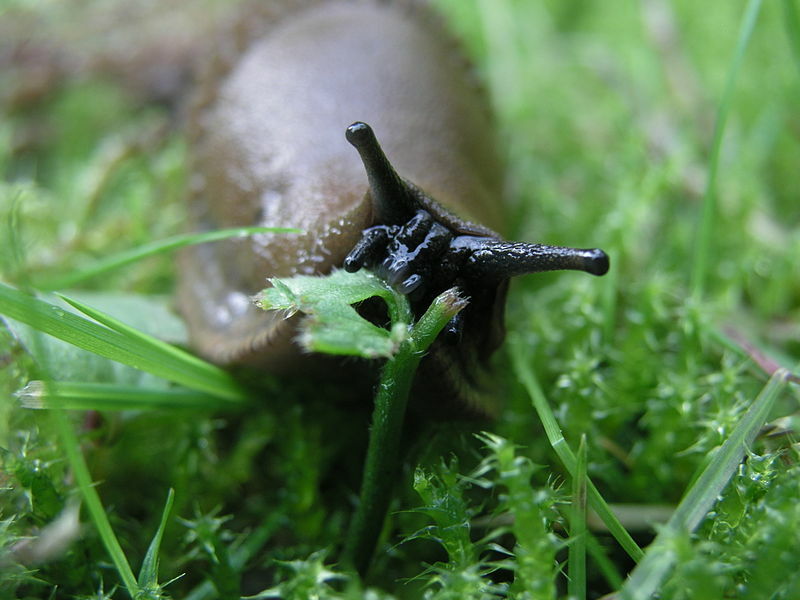 This rather common-or-garden topic may seem a little strange, but Ginn demonstrates wonderfully the spatial and ethical issues that arise when interrogating practices of slug control. Last month, the Royal Horticultural Society announced their “top 10 garden pests” (Stone, 2015 [online]), crowning slugs the ‘most troublesome’. As both Ginn and the RHS stress, slugs are unwelcome visitors to any garden due to their perennial appetite, ability to multiply quickly, and monstrously unpleasant appearance. They really do bug gardeners. But, as Ginn argues, ‘living with’ slugs has become unavoidable, and gardening is fast becoming a collaborative practice between gardeners and non-human actors, such as slugs. Pest control of any species inevitably poses ethical questions. Chemical solutions to slug control are frowned upon by gardening manuals. A recent article in Farmers’ Weekly (Clarke, 2015 [online]) documents the current rush of potato growers to use up methiocarb slug pellets, since the EU banned products containing the substance in January 2014 on the grounds that they endangered farmland birds. There are, of course, many natural or organic ways of dealing with slugs, although these may also raise ethical issues; copper rings, coffee grounds, beer traps, and sharp edges such as egg shells all deter these slimy pests, whilst the introduction of a ‘natural’ predator, such as hedgehogs, can also reduce numbers. However, a recent BBC News article has illustrated that the grass is not always greener on the other side (BBC News, 2015 [online]). In 1974, hedgehogs were introduced to the Uists in the Western Isles to control the burgeoning slug population. Whilst the hedgehogs have fulfilled their role, Scottish Natural Heritage has announced their removal due to their taste for the eggs of ground-nesting birds, causing a marked decrease in the number of birds such as the snipe. No matter what the method, gardeners kill slugs. Some may be reluctant or express guilt, but the fact remains that slugs are considered ‘out of place’ in the garden and, whether ethical or not, they are removed. Ginn identifies three forms of ‘detachment’ involved in slug control, in which gardeners separate themselves from their sticky foe. The first involves creating distance between themselves and slugs, deeming the slugs ‘killable’. More squeamish gardeners may also create distance between themselves and the practice of killing slugs. The second mode of detachment is to create a ‘hoped-for-absence’; precautions are taken to limit slugs’ access to gardens in an attempt to avoid encountering them in the first place. Grit, egg shells, or copper tape can be used to discourage slugs, as can altering the types of plants grown. Here, whilst gardeners create spaces that are about exclusion rather than encounter, it is clear that slugs, in their absence, still have a very powerful effect on human behaviour. The final method of detachment identified by Ginn is the recognition and acceptance that slugs inevitably affect gardeners, their practices, and the space of the garden. Sometimes you just have to accept defeat! So, by attempting to separate themselves from slugs through methods of detachment, gardeners are, in fact, reinforcing the connection between themselves and these sticky pests. This is further evidence to support animal geographers’ claims that humans and animals are inextricably linked. As much as gardeners fight against it, it seems, they are ‘stuck’ to (and with!) their slimy neighbours. Ginn, F. (2014). “Sticky lives: slugs, detachment and more-than-human ethics in the garden”, Transactions of the IBG, 39(4): 532-44. This entry was posted in Transactions of the Institute of British Geographers and tagged Animal ethics, Gardening, Human-animal relationships, Pest control, Slugs on March 9, 2015 by k8amongthepigeons.